Moodbidri, Dec 18, 2015 : A two-wheeler- lorry collision that took place in front of the Moodbidri post office on December 17,Thursday claimed the life of an elderly citizen who was also a retired teacher of Jain High School. 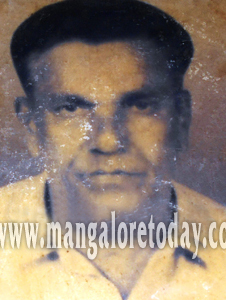 The deceased is Chandrashekhar Shetty (80) hailing from Ninjoor Padumane near Bailoor. The cement laden lorry knocked down Shetty’s bike and virtually crushed his left leg. Though Shetty was rushed to a hospital, his life could not be saved. Shetty was active in various organisations and had served as managing trustee of Kodimanithaya Daivasthana. He was also active in the Ninjoor Kambala Committee. He used to teach English and Social Science during his 26 year tenure as teacher at Jain High School and was also an officer of NCC Navy Wing. Upon retirement, he worked as an LIC agent.